Hey Creese.. I saw this post and am in midst of reading through it.. I also see the Video above and am intrigued with how things work.. Are the boards able to accept the Teensey 3.6? They should but I have not tested this yet. I noticed you sent me a PM but my inbox was full. Can you send it again? Small little success's are all that matter. which is 808 Pixels.. just running the basic Glediator test.. Next will be to see how many pixels I can hook up to one pair and get decent response times. 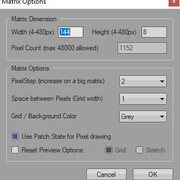 Once I figure that out then I'll decide either to go big (144 strips) or stay small (60)..
inside the octo gled sketch and 144x48 inside the Glediator matrix options.. and opened.. the program says I'm getting about 10-20fps.. and when playing with the options it looks and responds quickly which is really all I'm looking for so I think this is going to work out lovely. now the next step is to see about buying the leds & PSU's to actually push forward. But before I do that.. I ordered me a wiz850io to look at how artnet will work. As I'd rather this all be done over network not USB for future use. But for now I'm happy with the progress.. It looks good on paper.. will it work with all leds hooked up is the question! const int startUniverse = 0; // CHANGE FOR YOUR SETUP most software this is 1, some software send out artnet first universe as zero. Example dropdown from OCTO2811 but other than that I have no idea where I'm going next ;p I tried to play with glediator / jinx to see if I could easily add it but nope. This weekend will be some researching on how to do this.. If anyone has any handy links that help guide me in the right direction.. that'd be great.. otherwise I'll report back what I've come up with. Last edited by RyanLED; 01-21-2019 at 09:49 PM. Making progress! So I was able to get three Uni's working.. But 4-7 refuse to light up. 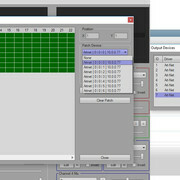 // as that just about maxes out the SRAM on the Atmega328. // but this is **technically** slower because 2 packets must be processed for all 240 pixels. 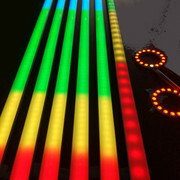 // this 'reads ahead' for all 3 colours before moving to the next led. //Do some VERY basic checks to see if it's an E1.31 packet. //Bytes 4 to 12 of an E1.31 Packet contain "ACN-E1.17"
//Only checking for the A and the 7 in the right places as well as 0x10 as the header. //to determine if the packet should be tossed or used. //This improves the speed of packet processing as well as reducing the memory overhead. to troubleshoot I did Patch first part with Uni 1. tested that lit up. then did uni 4 over same part. Started and nothing lit up. So it's not even getting uni4+. Wondering if this is a jinx issue? I also tried Glediator and nothing came of it.. Guessing because this ins't Artnet code..
One other thing I noticed .. the Last Pixel of the Uni or the First pixel of the next uni flashed randomly. Even when I only had 1 Uni on the Path I got 3 random pixels at the end of where a uni would be.